Jun 05, 2017: Screen protector that works with Otterbox Defender (S8)? Jun 06, 2017: Screen protector that works with Otterbox Defender (S8)? Aug 04, 2017: What's the best case + display combo you can buy locally like at day best buy or Walmart? Aug 06, 2017: Would this be a good GS8 case and screen protector combo? Sep 27, 2017: Any screen protector that works with full coverage? May 06, 2018: Liquid screen protectors? 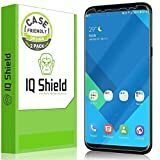 Feb 20, 2019: [Help]Where can I find a glass screen protector which is 100% case friendly?